With its polished stainless case and durable flame-fusion crystal, the Invicta Men's II Collection Chronograph projects an air of authority and confidence. The watch's unidirectional hatched bezel features engraved numbers in five-minute increments, which dovetail attractively with the slender, silver tachymeter. Featuring subdials with 60-second, 30-minute and day-of-the-week functions, the watch's dial displays hour indicators in embossed Arabic numerals and minute/second indicators in fine black hatches. 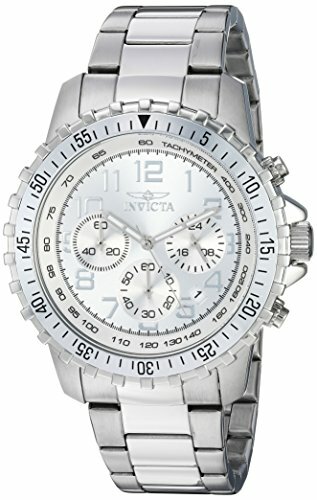 Metallic arrow hands, a date window at four o'clock, and the esteemed Invicta logo at the top center round out this timepiece. This watch arrives in a handsome yellow Invicta gift box and is water resistant to 330 feet.